A short time later Reinhard decided to produce a doll of this character and it was Max Weissbrodt from the famous Hausser/Elastolin company in Neustadt, Coburg, Germany who created and produced a doll to his satisfaction. 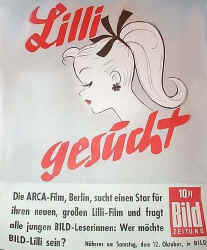 On August 12, 1955 Lilli was first sold in Germany, she was usually found in smoke shops and a few toy stores. 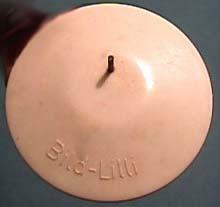 Later Lilli was exported to several countries, even the USA (these have a doll stand with only "Lilli" on them), the regular stand says "Bild Lilli". Lilli's original stand is just like "younger-cousin" Barbie's, it's round and the dolls foot has holes that fit on to a prong of metal. 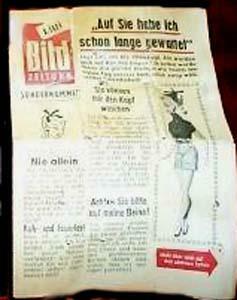 She was accompanied by a miniature copy of the Hamburg newspaper Bild-Zeitung and the cartoon continued to run in the real journal every Sunday. Lilli's entire packaging was designed by Mrs. E. Martha Maar (mother-in-law to the owner of the Hausser company and owner of a doll company 3 MMM Dolls), it consisted of a clear oval tube with the doll on a Lilli round stand as the bottom and a lid. The doll is unmarked. Her stand had her name on it. Lilli was produced in 7 1/2 to 8" or 11 1/2" tall, her shoes and earrings are molded on, she has a painted face with side glancing eyes with white irises, high v like narrow eyebrows, red lips and fingernails. She is all plastic with limbs attached inside by coated rubber bands. 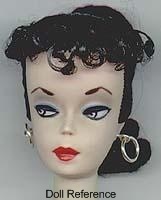 Her hair is a cut-out scalp that is attached by a hidden metal screw that was not meant to be played with and is in split curl bangs and a ponytail (Note: this was intended for adult males as a party or gag gift) usually found with blonde hair, however Brunette's were also sold. She came as a dressed doll, with additional fashions available separately. Her fashions have push together snaps usually marked on the inside snap with "PRMY". 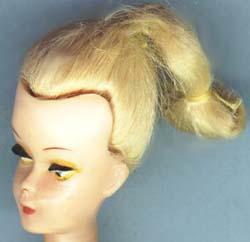 The Bild Lilli doll was also cloned and copied by other doll makers, see them on this page. This is the doll that Ruth Handler found while shopping in Europe in 1956 and was exactly what she had been thinking of producing. 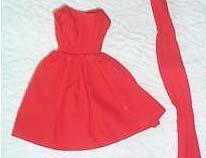 She bought three dolls; gave one to daughter Barbie and the others she gave to her designers at Mattel. The rest is pretty well known history. Barbie debuted at the New York toy fair on March 9, 1959. 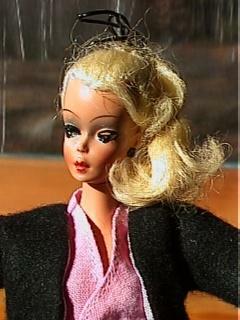 Mattel acquired the rights to Lilli in 1964, thus her production ceased. The Lilli head molds however were sold to a British Hong Kong firm named Dura-Fam Ltd. which produced the same 11 1/2" doll which is found marked "Hong Kong". Another set of molds were leased to Chang-Pi Su Co. who reduced them to 7 1/2 - 8" and released them as "Cherie". More blank molds went to Fab-LU (Luften, Ltd.) who sold a doll called Babs, Marx used them too and had a doll called Bonnie, a larger 15" doll called Miss Seventeen "A Beauty Queen" and a 7" doll named Miss Marlene. Sak Industries, Inc. used the mold and sold a doll named Babbie, and an Australian firm Haro-Mate Ltd. sold the dolls marked "Hong Kong" and carried the registration number of "British Patent #804566 and U.S. patent #2925684. Most of these dolls come from the 1960s. All this of course causes confusion to the collectors of a true Lilli who can command a price just as high as Number One Barbie's if not more. Author Note: We do not know if Marlene Dietrich ever noticed the uncanny resemblance of Lilli, if she was truly the inspiration, or even if she collected dolls. In Billy Boy's book on Barbie he suggests that Bridget Bardot may have been the inspiration or another of the blonde bomb shells of that era, but I think they came after Bild Lilli and perhaps she was THEIR inspiration. Bild Lilli 11 1/2" tall doll, doll is unmarked - her stand had her name on it. 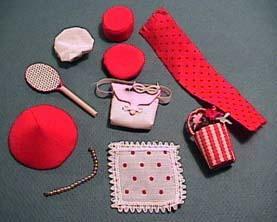 The 7 1/2" Lilli doll and outfits shown below were purchased in Germany in 1958 for Bonnie Schiedler, additional outfits were added to her collection over the years. 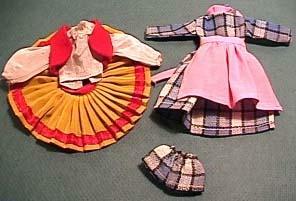 The doll and outfits shown were sold at auctioned in November 2000. As far as Lilli 7 1/2" clone or similar dolls, Marx Miss Marlene or Myra doll comes to mind, in England they had Miss Sweetheart doll. The 7 1/2" size Lilli doll was not copied like her taller sister. Bild Lilli doll 7 1/2" sheer night gown ensemble. Bild Lilli 7 1/2" doll casual outfits.